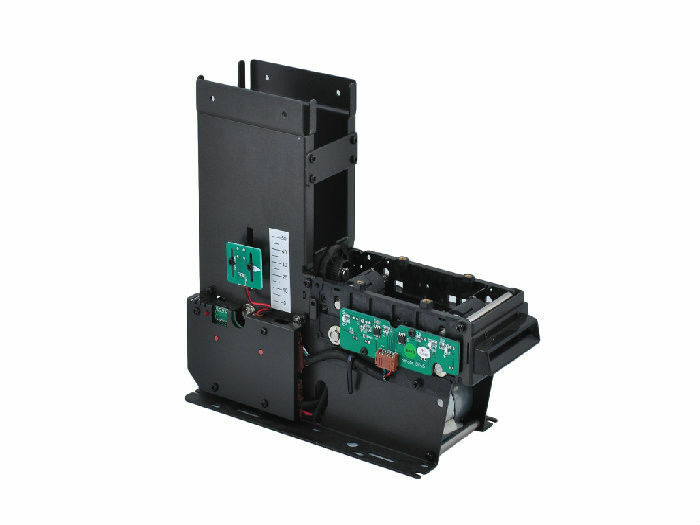 KH-F1A series card dispenser is a high-performance card issuing device which primarily dispenses paper tickets and PVC cards to users according to instructions from HOST. It is primarily applicable to self-service terminals such as parking lot management system, expressway toll gate, self-service charging system, self-service card vending terminal, etc. *Unique dispensing wheel design: is capable of issuing various embossing cards accurately. *Convenient and simple card adjustment design: is stable and accurate to dispense cards with various thicknesses. *Compact structure design: effectively saves space for the complete machine. *Rear card capture box: provides convenience for card management. *Simple collection channel design: satisfies user requirement for large collection amount. *Multiple sensors: are able to judge the card position and indicate the card status. *Scientific card transfer wheel design: automatically avoids dust accumulation which will lead to slippage. *Supports multiple communications (max. 16 C/Ds).